Learn all you need to know about cameras and lenses in 3D software. The camera is probably the single most important tool in the world of CG. It is more important than modelling and animation, and if the camera is pointing the wrong way, even the lighting won’t be seen. Therefore, mastering how 3D software handles camera manipulation is crucially important. Here, we take a look at the terms and information you need to know to be able to successfully work with the camera in 3D software. If you'd like more information on the different types of software and what they do, then see our roundup of the best 3D modelling software right now. Focal length information is vitally important as it determines the zoom or field of view (FOV), and this dictates what the camera is seeing. Learning about focal lengths and how they can be used for scene manipulation is incredibly important for making shots believable in terms of scale, and once this has been mastered it can become a great tool for manipulating images for more fantastical briefs. Most CG cameras default at a focal length of around 35mm, which is a very common focal length for cameras as a ‘do all’ solution. However, if the scene is of a portrait of a CG head bust for example, then a 80-100mm focal length would be more suited, as the longer a focal length the less perspective distortion occurs, making the bust look more realistic. Naturally the best way to learn about focal lengths is to use an actual camera, and this knowledge will easily transfer to your CG projects. One of the most common assumptions for a new artist working in CG is that the perspective view is the camera. While this is technically true as the software has created a virtual camera to view the scene in the viewport, this is not the same as an actual camera object. A camera object is usually identified as a film-style camera wireframe in the viewport, and typically has a properties palette full of information which makes it analogous to real-life cameras. A camera object usually has options for controlling focal length, and as it is an actual ‘object’ in the scene, it makes animating it a lot easier. Some applications allow the default front, top and side cameras to actually be seen and exported, but be mindful of these as usually they are best kept hidden. Not all digital content creation software comes with an easily recognisable camera object. 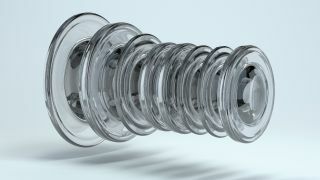 A good example is ZBrush – however, the focal length can be adjusted in the main view to create more compelling renders. Also, files can be exported with camera data into formats such as Alembic and FBX, which can be imported into a wide range of applications to ensure that the camera view when using a painting application such as Substance Painter matches up with the original scene. Wide-angle lenses (which tend to be classed as anything lower than 35mm) are good for wider scenes as they can catch a lot more detail. They are not great for close-up work as they distort features, so are unflattering for character work. Extreme wide-angle lenses are common in architectural work, but be mindful to straighten vertical lines; this effect can be achieved with tilt-zoom lenses, commonly used in high-end architectural photography, but can be re-created easily in software. Lenses that are longer than 50mm tend to be called telephoto lenses and are commonly used for character and close-up work, but they also tend to be used for macro work. Most portrait work is done in the 80-100mm range. Additionally, long telephoto lenses in the 150-200mm range can be great for certain types of scenes as they can be used to create interesting contrasts between the foreground and background. Zoom lenses are often seen as the ‘poor cousins’ of prime lenses, which have a single focal length, but good use of zoom lenses in a scene can be a great way of achieving some creative effects and looks. The ground-breaking spaceship work in the TV reboot of Battlestar Galactica depended on zoom lenses, and they can be used to create a dolly zoom effect – a technique in which there is an object in the centre of the screen while the background appears to zoom in or out. This article originally appeared in issue 242 of 3D World, the world's leading magazine for 3D artists. Buy issue 242 or subscribe here.